St. Philip's Church is pleased to accommodate baptisms, weddings and memorials in accordance with the rules of the Episcopal Church. Below you will find details and applications. Please complete the appropriate application and contact us in order to make arrangements. 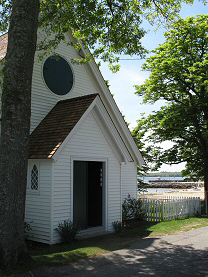 Please note that St. Philip’s Church is an Episcopal Church serving a summer community. Weddings performed in the Church must be done in accordance with the rules and practices of the Episcopal Church. A minimum of 60 days notice before the wedding is required, although the process of preparation and planning may take longer. Episcopal clergy must be present and involved in the wedding service. All couples are required to engage in a process of marriage preparation, normally involving several meetings with a minister. This process can be performed by the couple’s own parish priest – approved by our supply clergy – or by prior arrangement with a member of St. Philip’s supply clergy. A Church wedding is a religious event that has meaning only as part of a longer journey of faith in the Church. Part of the preparation challenges you to look at the role of the Church in your past and in your future life together. Often a wedding can be an opportunity to find a new relationship with a church community, a relationship that can accompany and support you in the years to come. We hope that couples without an active connection to the Church make contact with a parish in their home community. Couples of other denominations may be permitted to use the Church building for a marriage by a minister of their own denomination, with the approval of our own supply clergy and with the understanding that an approved Episcopal minister be present at the ceremony. In addition at least one member of the couple must be a baptized Christian. Click a link below to download the appropriate application for your service.